With bread any bread recipe requires a lot of kneading to activate the yeast as well as you need some sugar to feed the yeast. In this recipe you need neither. The yeast takes the natural sugars in the flour to activate and time will take care of the rest. It is cheap because your main ingredient, the flour, costs just 35 cents per kilo. Which yields about three breads. Now that is a really cheap bread. What makes it even better is that you know what you put into this bread. No conservatives, harmful additions, just a clean delicious bread. Start with the flour and put it in a bowl. Sieve the flour first before adding the yeast. Salt is the enemy of yeast so combine the flour and yeast thoroughly before adding the salt. Now it is time for hand warm water. Either stir with a wooden spoon or by hand. Make sure the water is absorbed by the flour and all of the flour is wet and you have a dough. 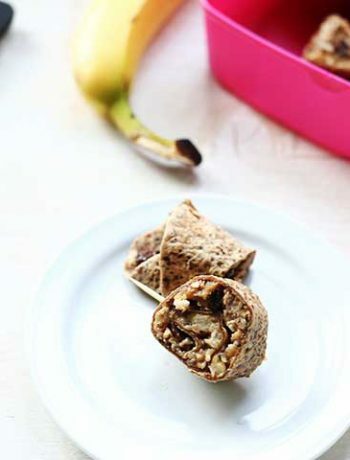 Wrap the bowl with cling film and set aside in a draught free spot so the dough can rise. Set it aside overnight so at least 8 hours. Pre heat your oven as hot as it will go. Mine goes 500℉/250℃. 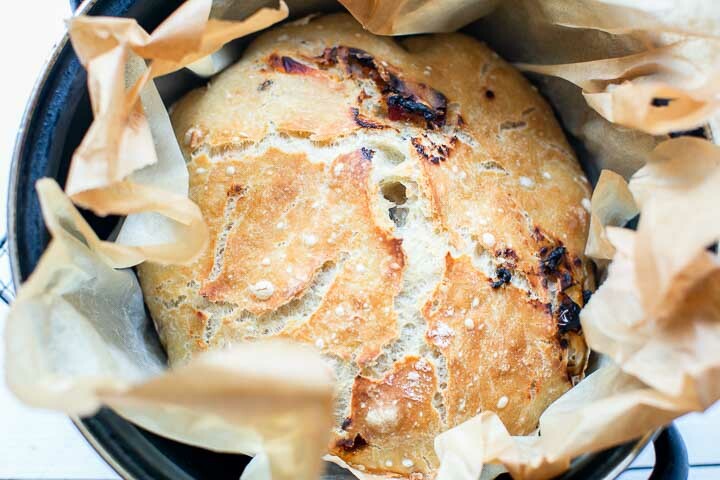 Take a Dutch oven and let it warm in the oven as it heats. Finely chop the sun dried tomatoes and olives. Take the dough out of the bowl and wrap sun dried tomatoes and olives in the dough. Put it on top of a baking paper and when the oven is hot take the Dutch oven out of the oven. Then put the baking paper and dough in the Dutch oven and close the lid. Put the pan in the oven and bake for 30 minutes. 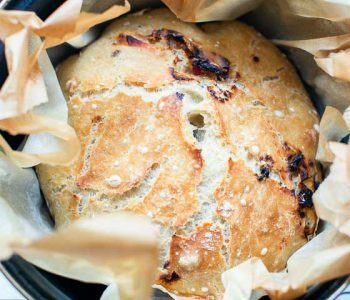 Then take the lid of the Dutch oven after 30 minutes and then bake the bread for at least 15 minutes or a little longer until the crust of your bread is golden brown. Take out of the oven and let it cool on a wire rack before serving. Look at that crust! You may be tempted to cut the bread straight away but wait until it has cooled else you will flatten the bread. When cooled your no knead bread is ready to eat. 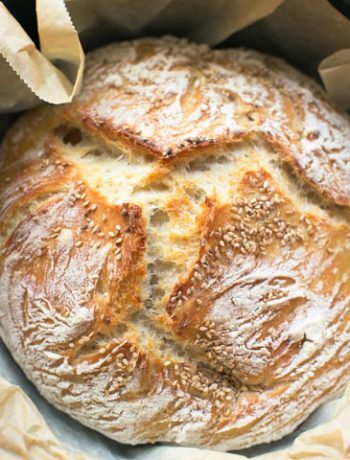 Have fun with this insanely easy wonderful no knead mediterranean bread recipe! 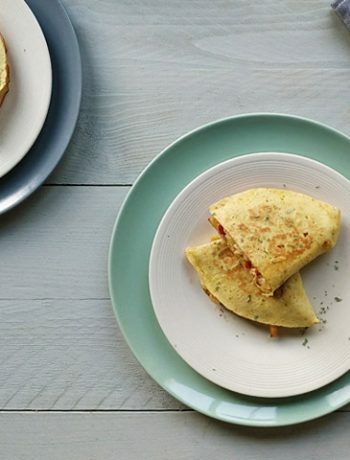 Made a recipe tag @thetortillchannel on Instagram or PIN on Pinterest. Combining the flour, yeast first before adding the salt in a large bowl.